The Nine Pyramids of Giza? 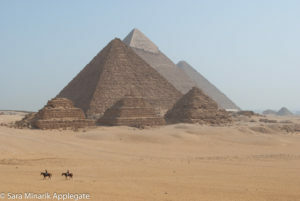 Most people think of the three great pyramids and don’t know there are 9 still standing at Giza…There were, as far as we know, originally 6 pyramids for the queens and 1 ‘subsidiary’ pyramid along with the Great Sphynx and many other tombs and cemeteries. The area was a huge complex of buildings, most of which is now covered in sand, but some of which you can still see. I’ve been very frustrated by how hard it is to find any mention on the internet of the queens’ pyramids, though. They seem to be completely ignored! Cairo was beautiful and it was some time before the Arab spring. It was a lot safer than it was then or even now. The architecture was full or eastern patterns and there were stunning Mosques everywhere! 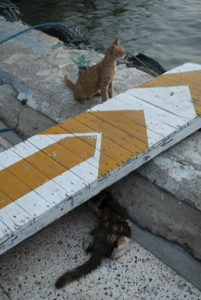 There were also cats everywhere, maybe descendants of the ones worshiped by the ancient Egyptians?